When you purchase your new vehicle with HGreg.com, we want you to use the best safety practices when it comes to your little ones. Here are 4 safety tips that every parent and guardian should know. 1: It’s probably not a good idea to use a previously owned car seat. If you’re considering a used car seat for your child, make sure you research it online. Make sure the used car seat isn’t one that was recalled or has been deemed unsafe. Sometimes newer models will be updated and will not have the faulty hardware (if there were any) that the previous model had. You will also want to make sure that the car seat has all of the original parts and has the original instruction booklet. If it doesn’t, it’s probably not a good idea to use it. 2: Place the car seat in the best spot possible. 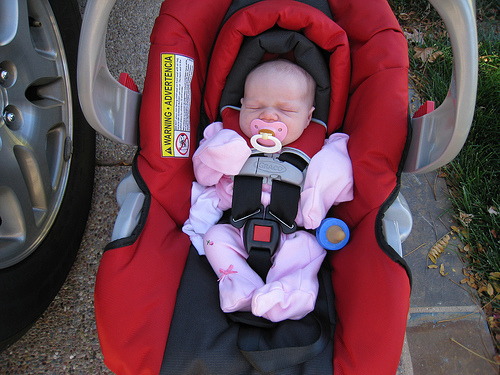 Experts will usually tell you that the safest place to put your child’s car seat is in the center of the backseat. Why? It is never a good idea to place your child’s car seat in the front seat, especially in newer cars with airbags. If you get into an accident, the airbags could fatally harm your child. Placing your child in the center of the back seat is usually the best place because it likely would get the least amount of impact upon a collision. 3: Correctly buckle up your child. Please be sure to read the manufacturer’s instructions before you attempt to buckle up your child. Sometimes buckling up your child can be tricky and will likely take a few tries before you get the hang of it. It is always important to read and follow the instructions explicitly, especially if you have a convertible car seat that allows you to use it for infants and toddlers. 4: Know when to start using the vehicle safety belt. You never want to start using your vehicle’s safety belt on your child too soon. Experts say that many children can safely use an adult seat belt between ages of 8 and 12. It is also said that your child should ride in the back seat until they are at least 13 years old. If you have questions about child passenger safety laws you can check with the National Highway Traffic Safety Administration for more information. i had a great experience buying at hgreg, thet have an awesome service where everyone is willing to help you specially salomon, the dealer who heped me, he is great and honest.